Orbin meets Edgar on a bus in London in 1934. Edgar: Sherlock Holmes cap, isn't it? Edgar: You have a long hair. Are you a human? Edgar: You have wizard's eyes. Orbin has decided to propose to Isolde and has his hair cut. Orbin is interested in mystery and he had long hair because he heard he got some special power if his hair was long. 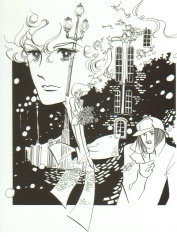 Orbin goes to a party in Isolde's house with white roses to give to her. She remembers he once proposed to her. She told him she would marry him if he had his hair cut. Then he preferred long hair to her. Casey Crayvas, a medium, also loves Isolde and gives her roses every day. During the party, Isolde and a maid find someone climbing a tree. They go outside and find Edgar sitting on the ground. He says he bet his friend that he can climb the tree. He says to Orbin, "You had your hair cut, Wizard." Edgar realizes Orbin is in love with Isolde. Isolde invites Edgar to drink tea together with them. She asks Edgar if he knows why Orbin made his hair short. "No, but he's disappointed that he's lost the chance to give you roses." says Edgar. "He deserves it. He kept me waiting for six years." says Isolde. Casey gets upset because Edgar said the seance is usually controlled by self-hypnotism. Casey insists he is a real medium and he has a magical power. An attendant encourages him to show them a ghost. He says if the ghost really appears, his magazine will sell more than usual and Casey will gain a fame. Casey suggests he make Edgar's family come out. Edgar tells him to call his sister. Attendants hold hands each other at the table. While Casey is trying to call Marybell, his body disappears gradually. The butler opens the door and yells out, "There's someone upstairs!" They expect Casey to be there, but there's no one. They find out the door of the bookshelf where rare books are stored is open. It seems someone got into and out of the room through an air vent, which is too small for adults to pass through. Orbin goes back downstairs and asks Isolde where Edgar is. She thinks Edgar is upstairs. When Orbin tries to go out to find Edgar, Isolde tells him to tell her the reason why he's brought the roses. Orbin yells, "It's not the time to do that. Casey's disappeared. Edgar is a monster!" and leaves the house. Edgar: Have you stolen the book ok? Allan: Yes. No one was in the room. Edgar: This book isn't about us. Allan: I'm disappointed. What were you talking about downstairs? Edgar: Nothing in particular. We just drank tea. Allan: I'm jealous of you. Edgar: I appreciate your efforts. Allan: Where will we be at Christmas?